Company offsite. The idea of a week spent working from a beach house sounds more than appealing. But before you swap your boardroom for an ocean view in a hope that your team will produce magic over pitchers of sangria, you might want to consider the following. Company offsite is a very real investment opportunity. It’s capable of generating more value and impact than the whole year of working around the clock, when done right. The trick is to turn the distraction-free, focused time of your team into the best innovating, creating and learning exercise of your life – while having fun. All you need is to equip yourself with the right set of tools and a few how to’s. There is a getaway. And then, there is a getaway with a purpose. We’d like to share a case study about supercharging a business opportunity for our client – combining powerful techniques, facilitation and inspiring environment – and tell you how you can do it too, in only 5 steps. Only a few months ago, we run our pilot retreat program inviting a handful of businesses to join for free. On top of building BizTreat’s proof of concept we had the privilege of hosting a variety of global companies. Having been thrilled about running the pilot in our home location Siargao island, we decided to tackle one of the local business challenges – a fundraiser for Filipino surfers to help them compete in international surfing competitions. Surfing is a huge deal in the tiny island of Siargao. In fact, only thanks to surfing the island has roads, beach resorts and direct flights from Manila today. Despite all recent developments and increased popularity of the tropical paradise, local islanders still suffer from the tag “developing society” and rightly so. No matter how talented and motivated to surf the local kids are, majority can’t afford more than sharing one surfboard amongst 10 of them. Despite this hardship, few local surfers were lucky to attract sponsors from resort owners in the island and train daily. First opportunities to attend surfing competitions opened up and humble Siargaonons made it to world surfing league rankings. There is nothing more encouraging for a closely knit community than success of its members. The local surfers became legends. They would serve as a point of respect and they gained authority as ambassadors for issues from environment protection to healthcare to well-being to sustainable tourism. Their voice would be heard on the island and beyond. That opened up entirely new world of possibilities for many. We were curious to learn how this magic could be reinforced. First step was helping everyone align towards the goal and ensure collective understanding of the challenge. We achieved this by drafting a project charter. After outlining context of the case study, Ian Sermonia, owner of Harana Surf Resort defined our goal: “We need to raise 320k pesos by May 12th, so that our four surfers can be sent to competitions in Sumbawa, Roti and Taiwan.” Certain activities to achieve this goal were already under way. Ian and few other key sponsors managed to get a handful of local businesses and individuals on board and they planned out a series of fundraising events in Siargao. Yet, as it often is with operations running at the speed of light and daily tasks pouring in, Ian and the stakeholders kept wondering. Were the right opportunities being leveraged? Was there anything else that could help hit the target? As soon as we began talking about the audience of this project, an apparent gap emerged. It became clear that there was an underserved opportunity in terms of people who had interest in supporting this type of good cause in Siargao, but who were not physically present on the island at the time of the locally organised events. Having brought together a combination of experts in business analysis, social media, community management and nonprofit management really helped connect the dots and open up the opportunity space. Our main mission became a better definition and understanding of who the potential contributors were and how to attract them. Opting for a user-centred design research was a no brainer. We devised a quick battle plan made of drawing customer journey map, defining personas and running customer interviews. 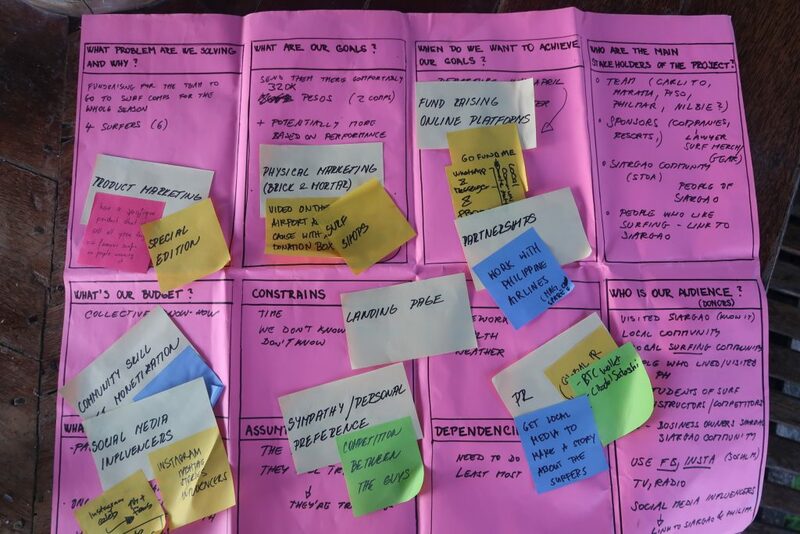 This helped us get away from linear thinking and begin thinking in mind maps and connections as often promoted by IDEO, the home of design-thinking approach. The initial activities helped us to understand who the audience was, where it was coming from, how these people were thinking, what media they were using, what their interests they had and so on. Lots of useful pieces of information and inspiration for coming up with ideas how to best attract this crowd. Right after a fresh, locally sourced fruit salad we sank into a rapid ideation exercise. In a 20 minute session we managed to produce over forty ideas for accelerating the campaign. 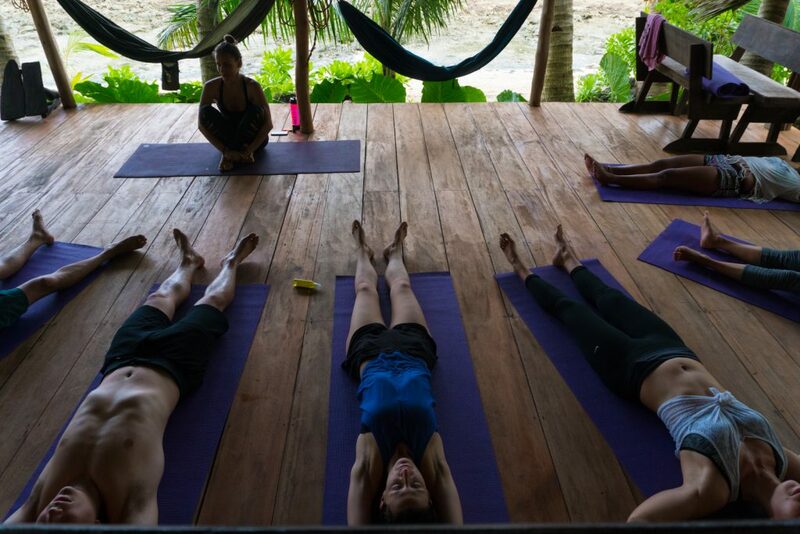 It was time for everyone to decompress in a yoga practice. 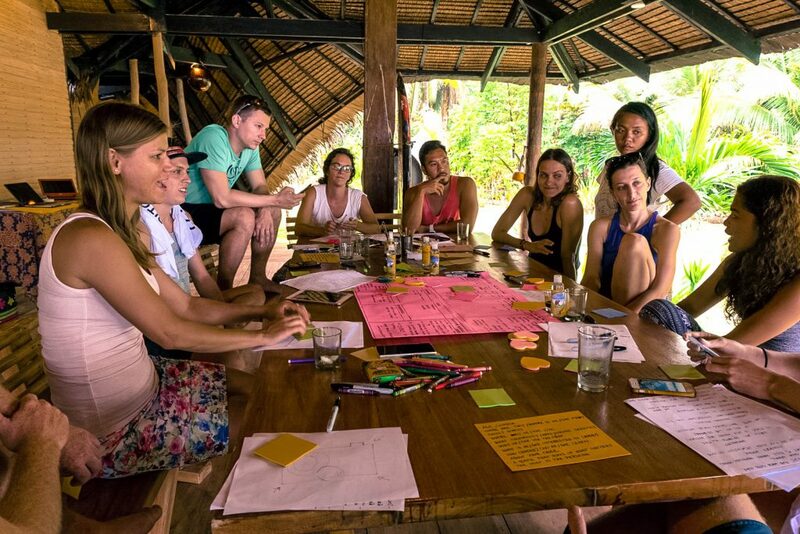 After the yoga, we gathered the whole group again and synthesised the results of everyone’s work, which immediately emerged as newly defined opportunity areas for Ian and his team to take away. The focus, which people put into the workshop transitioned into excitement as we were wrapping up and talking about implementation of the new ideas. People were committing on the spot to help with individual pieces of the campaign, that’s how thrilled they got about the ideas they achieved to produce themselves and with their peers. General sense of impression around the ‘looking at things from a different perspective’ and the actionable results it produced was felt among the attendees. As a final note, you’d be pleased to know that many of the ideas generated at our workshop were applied in the months that followed. The local surfers are now competing all around Asia and the wave of stoke is spreading throughout the island with every successfully ridden wave. Our experience faciliating offsites on the beach has motivated us to consolidate useful tips for planning and organising offsites. Check them out in our next post 5 things to consider when planning a company offsite.